Using its own airSOUND tech the A70 wants everyone to get the same pseudo stereo sound without being in the 'sweetspot'. 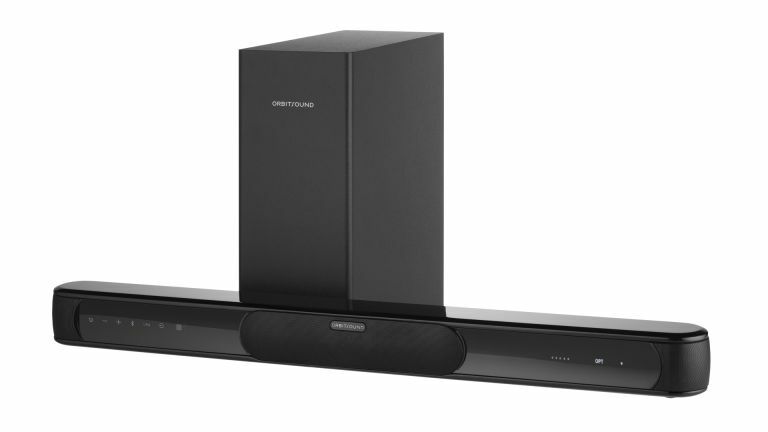 British audio tech company, Orbitsound, has just announced its new A70 airSOUND compact soundbar - a device aiming to ditch the necessary sweet spot of stereo. By eschewing stereo sound it's almost the complete opposite of Yamaha's YSP-5600 and it's Dolby Atmos / DTS:X array. The small form factor soundbar is built with five different speakers set inside its relatively diminutive piano-black wooden chassis, with three arrayed at the front and centre of the A70 and a further two at each end of the bar. The interesting thing is that the neodymium drivers on either side produce the same sound and aren't split between left and right channels. The A70 gets its stereo fix by having those side speakers interact with the central array to produce its stereo sound. The idea is that wherever you're sat in a room you'll get the optimum sound from the A70 without having to position yourself in the traditional stereo sweet spot. And by packing a 300W output into that little frame means the A70 can really fill the room with sound. It also comes with a wirelessly-connected subwoofer too, using Bluetooth instead of the 2.4GHz wireless connection Orbitsound previously, which now offers a lower latency of just 9ms. But the A70 has not just been designed for you to blow the eardrums off your cat at the drop of a hat, the airSOUND technology has been created to produce clear audio even at low volumes too. Orbitsound's A70 is also sporting all the goodies you'd expect from a £500, high-end soundbar too. Namely optical connections for your TV, touch buttons, NFC pairing and Bluetooth 4.0 with aptX compatibility for CD-quality wireless audio. We've got the A70 in the labs at the moment and will be putting it through its paces very soon. The best TVs to plug a soundbar into.